Lightning fast data transfer speeds of up to 600x and enormous capacities, make Verbatim's Premium UHS-I flash memory cards perfect for use in memory-hungry, high performance digital still and video cameras, as well as other multi-media devices. The increased use of high-definition video, high-resolution digital photography and mobile applications demands higher storage capacities and faster data transfer rates. 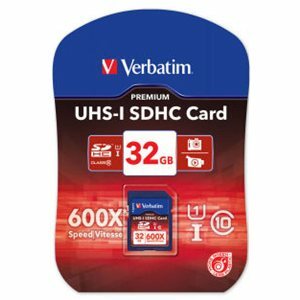 Verbatim UHS-I memory cards meet the new Ultra High Speed designation set by the SD Association, with the highest levels of performance and capacities to match. UHS-I (Ultra High Speed) memory cards can achieve the highest speeds only when paired with a UHS-I device. For devices without the UHS-I interface, the guaranteed maximum data transfer rate for Class 10 will be 10MB/Sec. Verbatim's Ultra High Speed SDHC memory cards are fully compliant with all applicable SD standards. They also contain a write protect feature to prevent accidental erasure. SDHC and SDXC cards use the same physical format as SD cards but cannot be used with SD host devices that do not comply with the SDA Specifications Version 2.0.